I was a little distracted from completing the second sockette by these wonderful colors.. 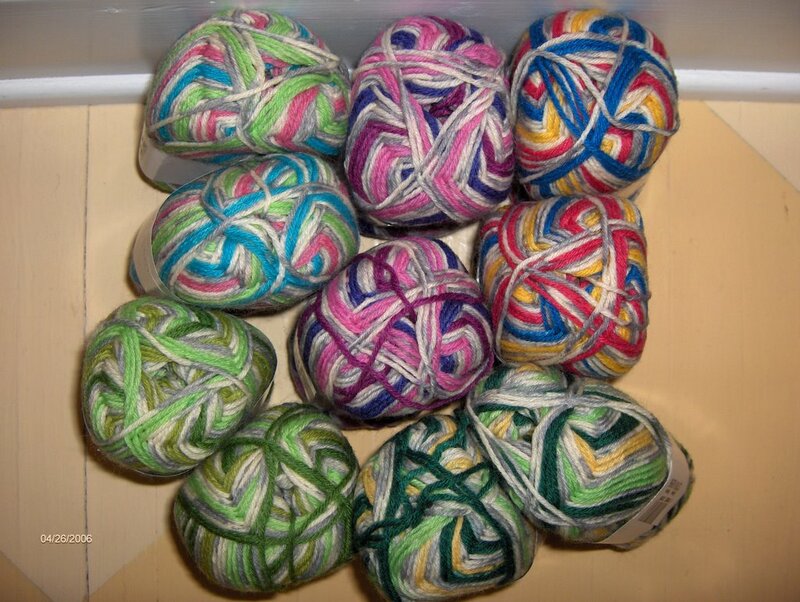 I received my order of clearanced price KnitPicks sock yarn Friday. 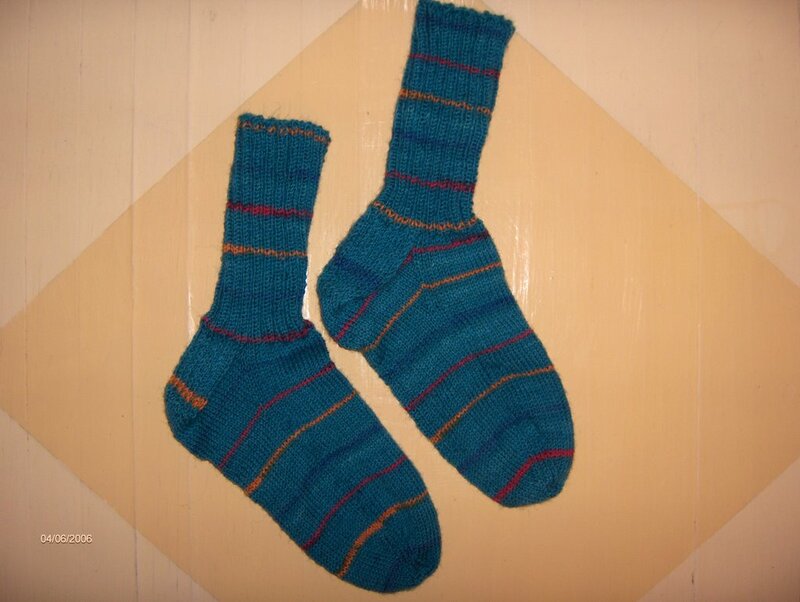 My oldest son has requested socks and fingerless mitts. I got back to the other sockette today and they fit perfectly. 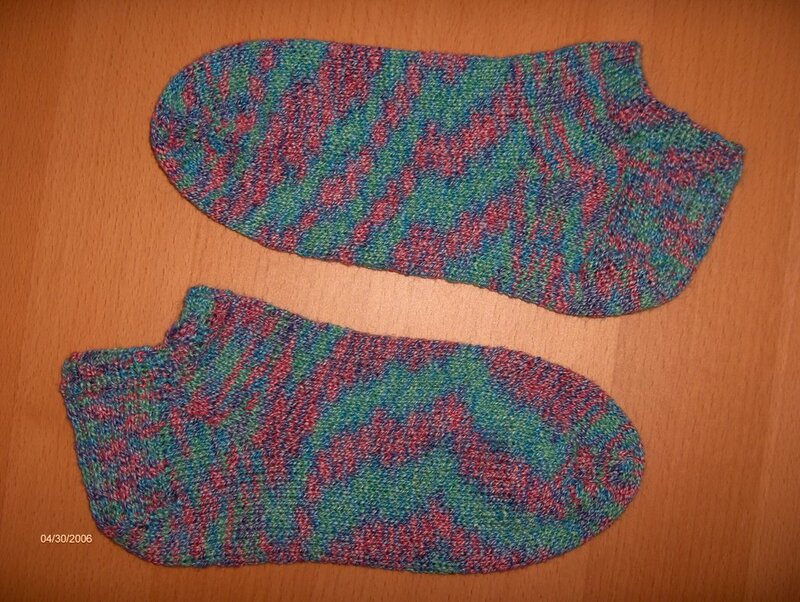 I used about half a skein of Plymouth Sockotta color #18 on size 2 Inox DPN. I'm off to start another small project with the Knitpicks yarn. 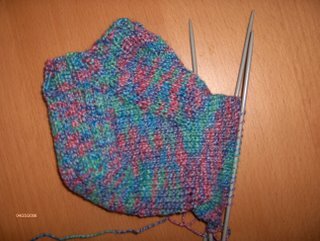 I started on my second pair of socks,one skein sockettes, about 2 weeks ago. 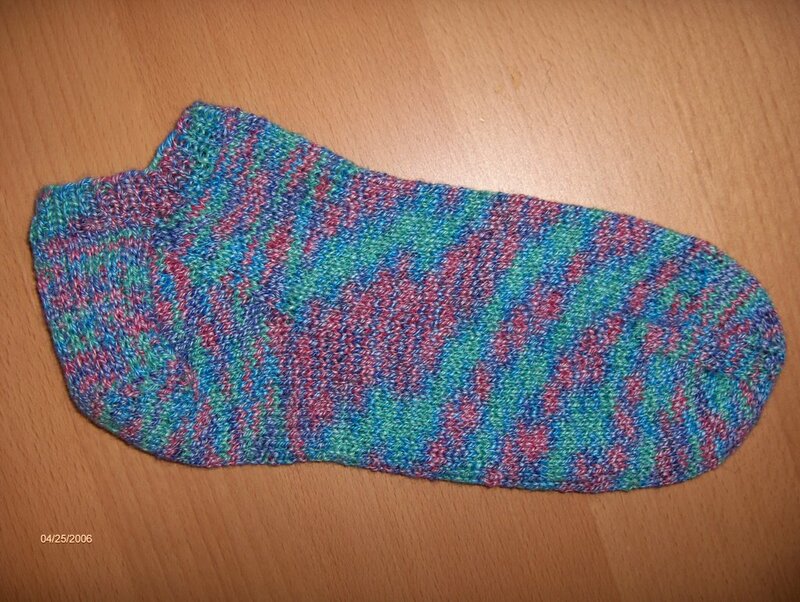 Things were clipping along and I finished the first sock within a few days. Then came my parent's visit during Easter week. I should have put my needles down in anticipation of not being able to think coherently enough to start the next sock, but I didn't. Knitting helped me keep my sanity throughout their 6 day visit. I realized this morning while working on the body section of this sock that I messed up the cuff. For some reason I decided to do a K2, P2 ribbing. This would be fine except on the first sock I did a K1, P1 ribbing. Enter lots of of expletives here @?!%*$!@?! It took 15 seconds to rip out hours of work. I know I've been there before, same time of the year, same weather, same feelings. It was April 2000. 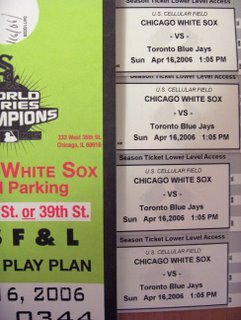 I aquired Cub's tickets through my employer and we headed off for a day at Wrigley with my oldest(3 years old at the time). 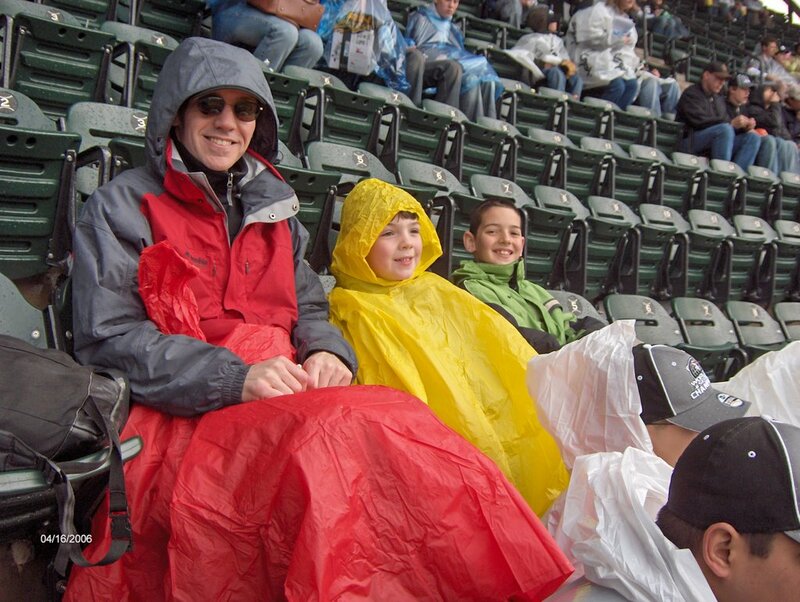 We sat through a rain delay and were cold and miserable and swore we would never go to an April game again. Fast forward 6 years. Sunday we got to experience the pain of sitting in the rain in 40 degree temperatures all over again. Once again I swear to NEVER go to an April game in Chicago again. I mean it this time!! 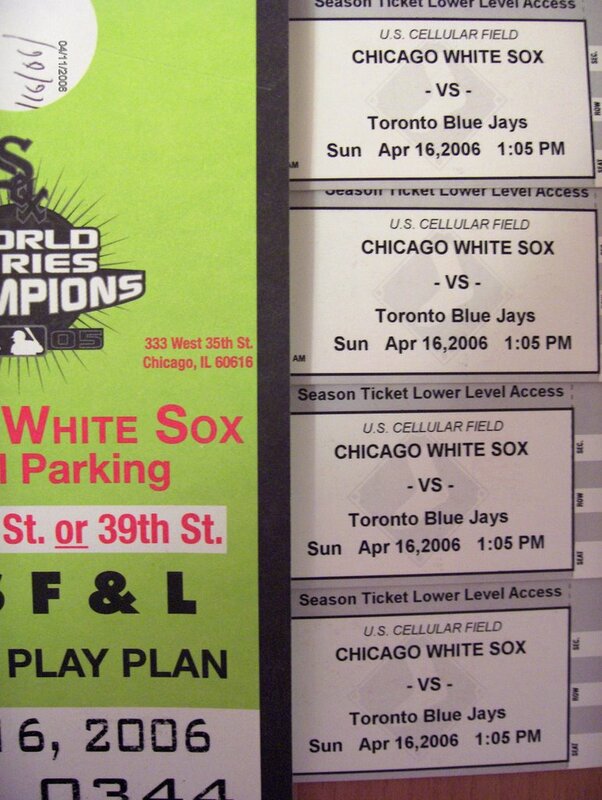 The good news is I won a four pack of tickets and a parking pass to see the White Sox. The not so good news, the game is on Easter Sunday. My Dad declared,"don't think I can say I've ever eaten a hot dog and peanuts for an Easter dinner before." 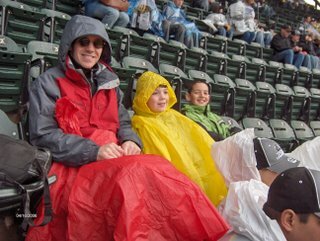 I'm glad my parents take things as they come, they were excited about the opportunity to go to another White Sox game and spend time with their grandkids. Thanks Mom & Dad!! The best thing about working a "graveyard" shift at a retail store is my ability to listen to podcasts the entire shift. I listened to 2 "new to me" casts that were really interesting. The first is Quirky Nomads. After the 2004 election I told my husband ,"when Illinois turns red on the election map, we're out of here." So when I read her tag-line I knew I had to check it out. "It's the story of a family that said, "If the Republicans get any worse, we're moving to Canada." And then? They really did. "I first heard about her from the show she did for Brenda Dayne of Cast On. Sage's podcasts are generally under 15 minutes. I found myself listening to a few hours of different shows last night. If you have the chance check her out. Another "new to me" cast this week was Escape Adulthood. It's a couple from Madison,WI trying to do just that, escape the reality of being a grownup. Now for me, I don't have to go very far to escape. I'm blessed with 2 kids that keep me entertained and feeling like a kid most of the time. At the beginning of this year Kim & Jason challenged themselves and listeners to a "40-day program,The Escape Plan, designed to help you safely and effectively treat Adultitis." It's a great concept with lots of fun ideas. Each day there is a challenge that won't take more than 15 minutes to complete but will put you in a happier "kid-like" state of mind. There are lots of fun ideas like speaking in a phony accent to a stranger, or doing something your parents would never let you do as a child. This week, as a family we built bugs out of toothpicks and different fruits and vegetables(celery, raisins, grapes, carrots) and then ate them. It was a moment where the husband and I reverted to thinking like a kid. If you haven't done anything fun and kid-like this week go do it. It feels so refreshing. I know it's a little hard to believe but I finished another project. What: My first try at knitting socks. Needles: Size 2,Inox,8",aluminum double points. Yarn: Reynolds Swizzle superwash sock yarn in a color the 4 year old picked out. 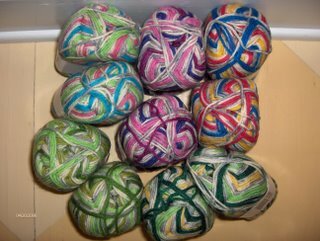 1 skein with lots to spare. It took how long? : At least a month. Modifications: I decreased the suggested cuff length of 8 inches to 6 inches. I increased the suggested foot length of 7 inches to 8 inches. I didn't have any problems following along with the tutorial. For me that's amazing because I always encounter at least two WTF moments when reading a pattern. 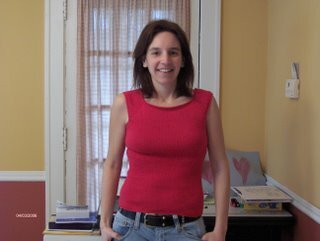 Yes, I finished a knitting project last week. Needles: 24" No. 5 Clover bamboo circular. Yarn:KnitPicks Shine sport in Cherry(5 skeins). Modifications: I added 4" onto the suggested length of 1 1/2" after the waist increases. I would have made it even a bit longer in length but I ran out of yarn. I'm not sure if I can get into the form fitting aspect of this shirt but when it gets warmer I'll try it out.